The heat in Singapore can be pretty overwhelming especially when you’re checking out Kampong Glam. 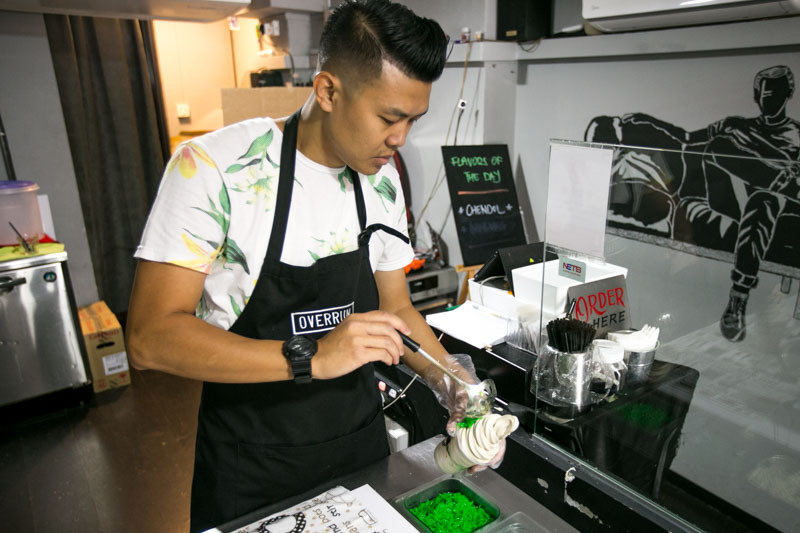 Overrun has been making waves with its chendol flavoured soft-serve that will bring you back to the days of binging on Mr. Softee’s chendol ice cream at 7-Eleven. After hearing so much about it, we decided to drop by one afternoon to try it. 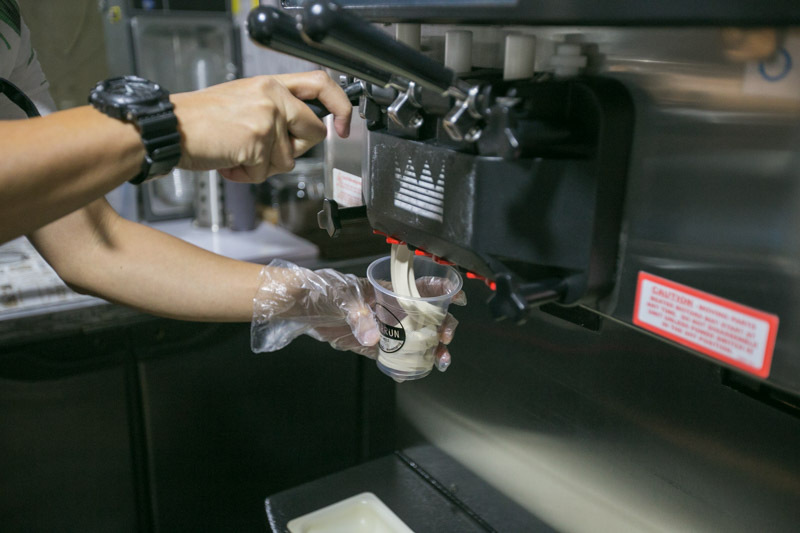 There is no seating area at the shop, so you will have to takeaway your soft-serve. 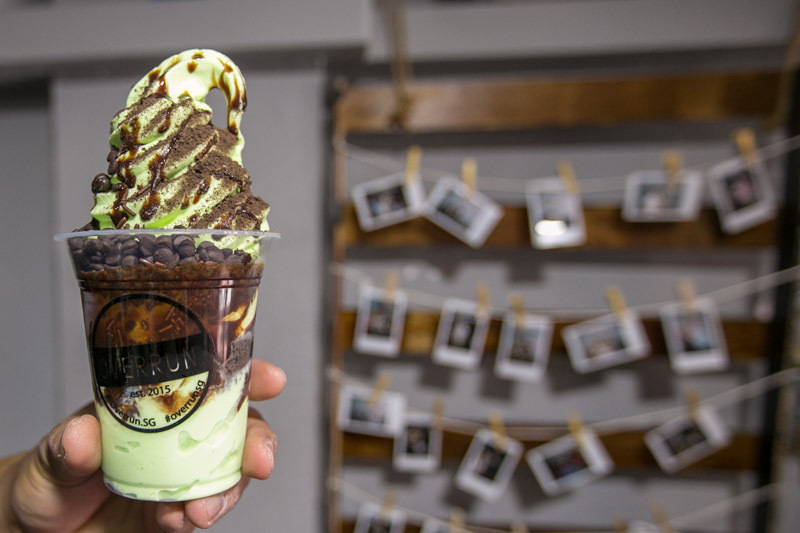 The humble family-run shop started out in late 2015 by Mr Idris and his wife, serving sandwiches and coffee but only went viral with its offerings when they switched to selling soft-serve in March 2016. 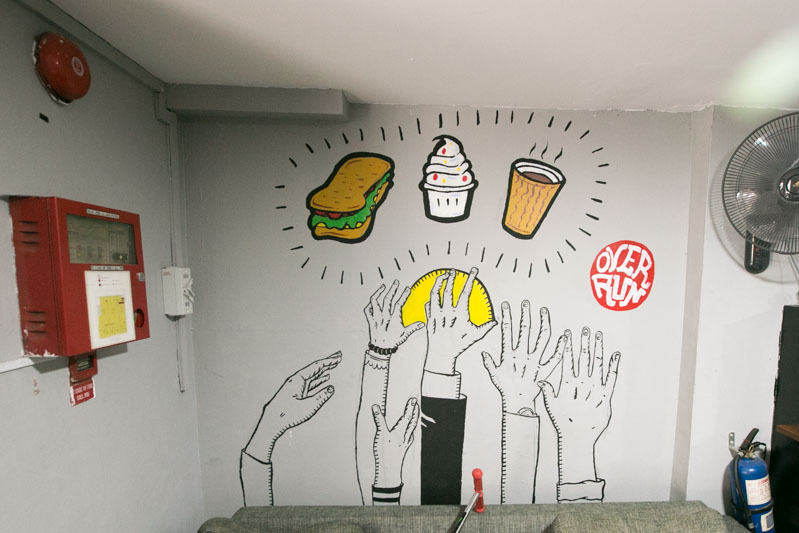 Walking into the shop you can find graffiti art on the walls that is reflective of the street art culture in the surrounding areas. You don’t have to ponder too long about what to order. 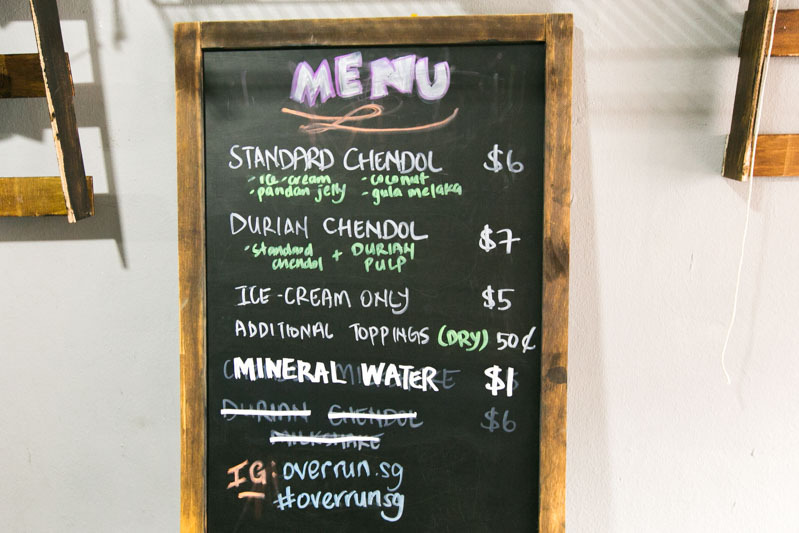 Go for their signature chendol soft-serve and add on $1 for additional durian. 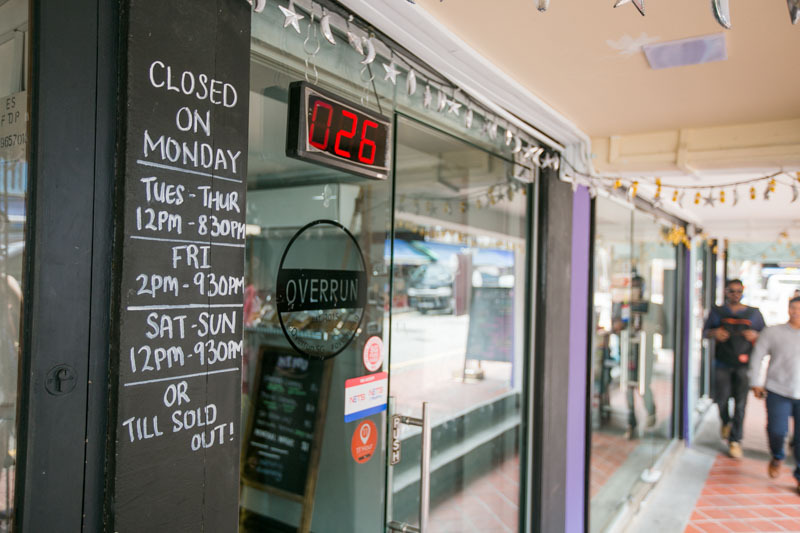 Overrun does one special flavour each week to create more diversity to its menu. 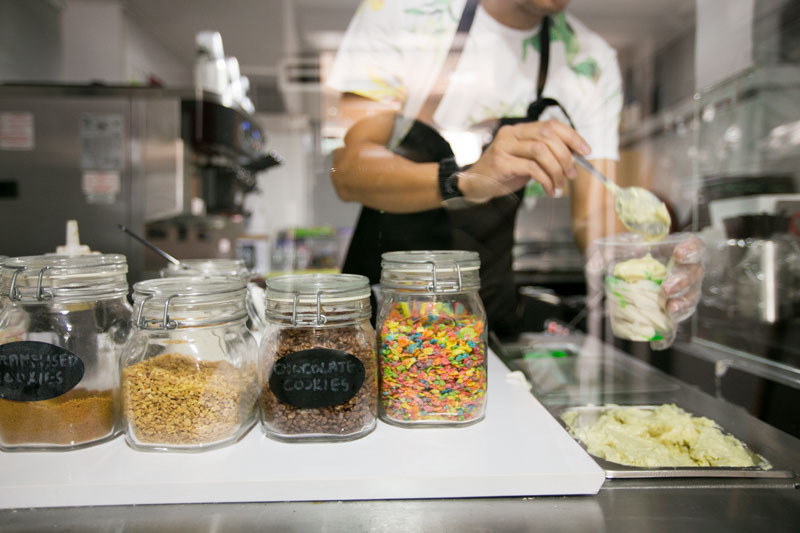 If you want to jazz up your soft-serve, choose from dry ingredients at an additional $0.50 per ingredient, including caramelized cookies, roasted peanuts, chocolate cookies, rainbow cornflakes and marshmallow bits. We watched with anticipation as our chendol soft-serve was being prepared. 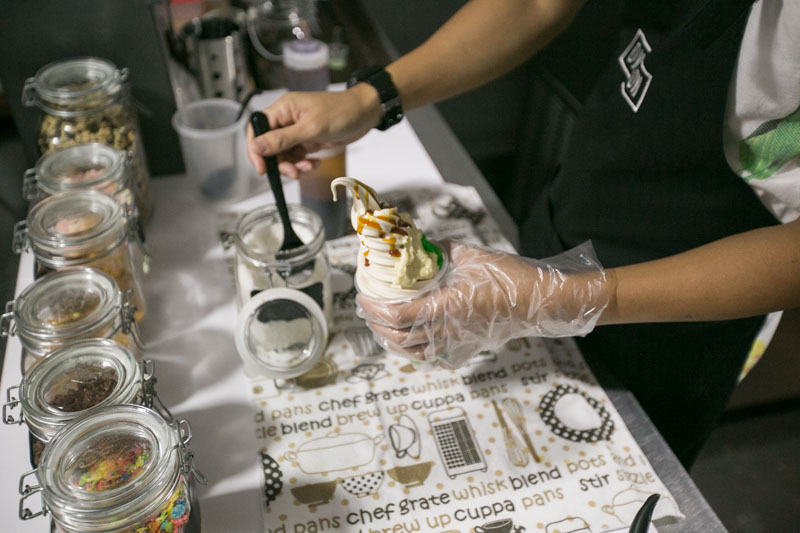 First, the cup gets filled with luscious twirls of soft-serve before the gula-melaka (palm sugar) and pandan jelly bits are added to it. The cup is then filled to the brim with soft-serve again, and then finished with more gula-melaka syrup, pandan jelly bits and coconut flakes. The Chendol Soft-Serve with Durian Pulp ($7) is the perfect local treat for a hot Singapore afternoon. 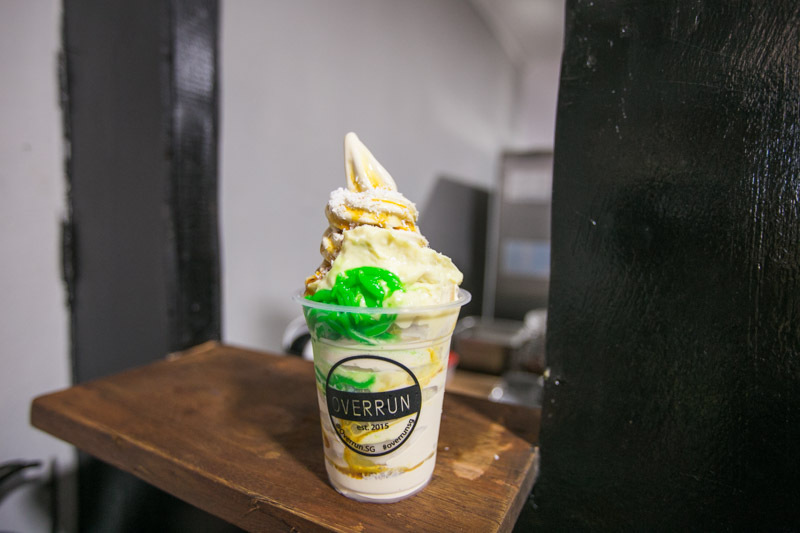 You can really taste the distinct gula-melaka sweetness from the soft-serve, coupled with the different textures from the pandan jelly and soft, creamy durian pulp. We loved how it was not too sweet despite the generous amounts of gula-melaka. Each mouthful is a perfect balance of sweet creaminess against the bitterness from the durian. We couldn’t resist ordering their weekly special soft-serve as well. The Mint Choco Chip Crumbs ($6) was the perfect perk-me-up for the afternoon, and a classic combination and can never go too wrong. The refreshing notes of the mint really help cut through the rich chocolate, which makes for an alternative that is worth ordering! It’s not everyday that we find a family-run business that proudly flies the flag of local flavours through their foods. Do check out their Facebook page to find out what seasonal flavour is on offer for the week. Expect to be overrun with emotions as you bite into the local flavoured soft-serve. We can’t wait to see what other unique and interesting flavours will be launched.